Other Map implementation which uses equals() and hashCode() doesn't work well with mutable keys. For example, if you store a mapping in HashMap and then went on to change the key object the hashCode generated by key later will not be the same as before. Even if you return same, the equals() method will not return true when you compare key object from entry to given key object. So, that's the basic difference between IdentityHashMap and a HashMap in Java, let's see a couple of more and some code to understand this concept better. As I said, IdentityHashMap is a lesser known class from JDK, you might never use this class in your project but a good chance is that someone else might have already used. Since most of the programmers spend more time reading code than writing, it's important to know what is IdentityHashMap in Java, what it does, how it works, and when to use this class in your Java application. Once you understand the difference between IdentityHashMap and HashMap, you will automatically learn how to make the best use of this class. You need JDK 7 to run this program because we have used diamond operator (<>) to shorten the Generic code, though nothing stops you from being running it on Java SE 6 once you remove the diamond operator and specify the types on right side of initialization as well e.g. Using Generic is also one of the Java coding best practices which you should always follow post Java 5. 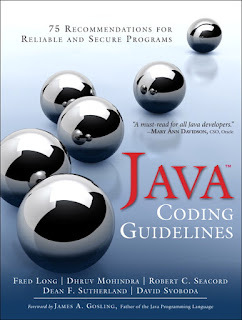 You can see Java Coding Guidelines: 75 Recommendations for Reliable and Secure Programs for more of such best practices. 2) Another significant difference between HashMap and IdentityHashMap is that later uses System.identityHashCode() instead of hashCode() method of key object. This means you can also use a mutable object as a key in IdentityHashMap, which is not supported by HashMap in Java. I mean there won't be any compilation error but it will not work as expected i.e. you will not be able to retrieve object back once you modified it state because its hashCode also got changed. Let's see how this work in IdentityHashMap with an example. Let's assume we have a class called CreditCard, which has a field called expiry, which is nothing but a formatted date in String format. Later we change the CreditCard object by changing it's expiry and see if you can find it out again from both IdentityHashMap and HashMap or not. From the output you can see that once you changed the CreditCard object, which is key in both HashMap and IdentityHashMap, you are not able to retrieve object in case of HashMap but you able to retrieve when you use IdentityHashMap because former uses equals() method which return different value once expiry date changed and later uses == operator which return true because in both cases the object is the same in heap. You can also read Core Java Volume 1 - Fundamentals by Cay S. Horstmann to learn more about IdentityHashMap class in Java. It uses identity methods i.e. equals and hashCode to retrieve values. It uses reference equality instead of equals() method i.e. object1 == object2 instead of object1.equals(object2). For hashing, it uses System.identityHashCode(key) instead of key.hashCode() as used by other Map implementations. The java.util.IdenityHashMap class is used in Serialization and deep copying, where your key is "Class" object or interned String. 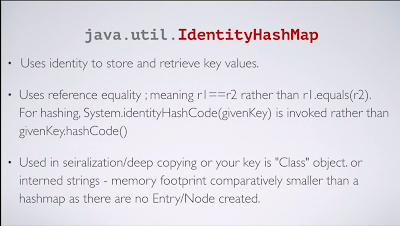 That's all about the difference between IdentityHashMap and HashMap in Java. There are rare cases where you want to use the IdentifyHashMap but it's good to know about it.